leslie speaker clone. An 8" speaker fires into a rotating foam baffle to give a vibrato / phaser / wah effect. 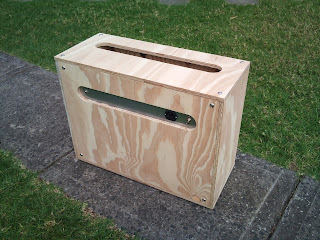 The design is loosely based on the Fender Vibratone. 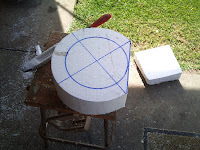 Rotating baffle carved from Styrofoam. 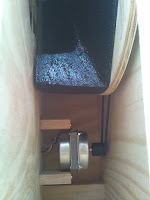 A plywood partition separates the speaker from the rotating baffle. 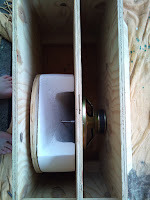 The partition also supports the nylon bearing that allows the shaft to spin freely. An aluminium boss attaches the baffle and pulley to the shaft, which is turned via belt drive by a small electric motor (taken from a pedestal fan; $8 from K-mart). The motor runs at a 3:1 reduction so that the baffle spins at approximately 400rpm.